The students are exposed to a variety of songs, dances and music while developing their imagination, concentration, creativity body awareness, and appreciation of dance. Emphasis is placed on teamwork and respect for others. 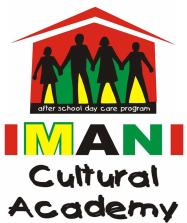 Click here to register your child with IMANI Cultural Academy!